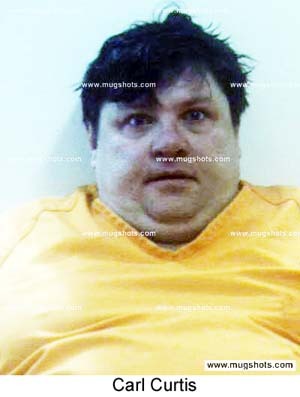 OKLAHOMA -- Back in May 2004, Steve Standifer was one of the 20+ cretins who were arrested after a months-long undercover operation into dog fighting. Standifer was charged with: Racketeering, conspiracy, keeping a dog for fighting, instigating a dogfight, facilitating a dog fight, cruelty to animals, keeping a place or equipment for dog fighting. 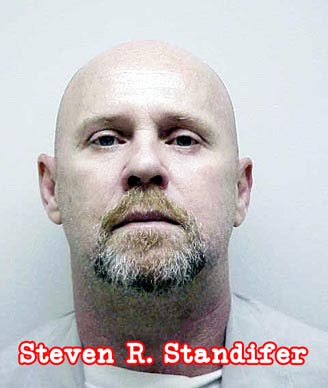 Standifer was convicted on June 24, 2005 on six charges. Unfortunately, it looks like the judge gave him 7 years in prison for each crime, but ordered that they be served concurrently (all at the same time) rather than consecutively (which would be one after the other). If the judge had taken a real stand against animal abusers he would have ordered that he serve the sentences consecutively. If he had, Standifer would have been sentenced to 49 years in prison. Instead, Standifer headed off to serve his 7-year sentence but didn't even have to serve half of that time. In face, he was released after just 2 years, 4 months, 2 days. Pathetic. Of course, Steve is no stranger to crime. Before he got busted torturing and killing animals, he was arrested back in March 1992 in Pottawatomie County. He was convicted of "CULTIVATION OF CONTROLLED SUBSTANCE" (aka marijuana) and "DISTRIBUTION OF CONTROLLED SUBSTANCE IN POSSESSION W/INTENT TO SELL" (aka being a drug dealer). Again, even though he was given 4 years (48 months), they let him serve them concurrently (at the same time) so that was immediately cut in half to just 24 months. And he didn't even have to serve half of that 24 month sentence. If you look at his enter/exit dates (3/26/1992 - 2/20/1993), you'll see that he only served 10 months, 25 days. That's not even half his sentence. Criminals have no reason to stop committing crimes. Sentences are a joke. When the news reporter tells us someone is "facing up to 40 years in prison", it's all a joke b/c they'll be out in 7 months. 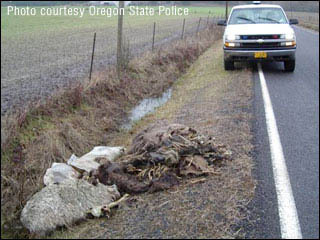 OREGON -- Two Junction City area men face animal abuse charges, accusing them of dumping sheep carcasses into a ditch. The animals were found in a ditch on Cox Butte Road. Police say a dying sheep, found under the carcasses of at least four other sheep, had to be put down. Trooper Marc Boyd also discovered several aborted lambs and a live ewe underneath the dead animals and body parts, according to according to the state police. "For me, it was actually very disturbing that someone would do that," Boyd said, who began working for the state Department of Wildlife in 1990. "I've never come across anything like that." After assessing the ewe's condition, Boyd determined that he had no choice but to destroy the animal. "She had shallow breathing and was in very poor condition," Boyd said, adding the aborted lambs were found to have come from the ewe. "The only right thing to do was euthanize her at the scene." Boyd then contacted several sheep ranchers in the area and at 4:11 p.m. found that Sanchez - who lives on Dorcy Lane southeast of Junction City - had evidence at his residence, including several Barbados sheep similar to the carcasses, tying him to the dump site. Sergio Sanchez, 44, and Rosendo Orbe Diaz, 22, both from the Junction City area, were cited Feb. 6 on charges of animal neglect. Diaz was also cited on a charge of placing an offensive substance in waters or other property for allegedly helping Sanchez dispose of the carcasses. The citations are misdemeanors, carrying up to $6,250 in fines and one year in jail. PENNSYLVANIA -- Carl Curtis was booked on multiple charges in Washington County, PA.
TEXAS -- A vicious dog attack here in Lubbock puts the animal's owner on trial. A Lubbock County Grand Jury handed down the first felony indictment for a dog attack Tuesday afternoon. William Cox told police two pit bulls attacked him in September. The dogs seriously injured Cox, and killed his rat terrier. Both pits have since been put to sleep. Now, the dogs' owner, Javance Johnson faces a 3rd degree felony charge and possibly time in prison because of a new law that went into affect just weeks before the attack. Cox told NewsChannel 11 that he wants the owner to receive the maximum punishment, and folks we spoke with say the owner should be held accountable. "They got him instead of me," Cox said. He's talking about his rat terrier, Patches. Back in September, Cox told authorities he was taking out the trash when two pit bulls ran into his yard. "My little rat terrier was blind. They tore the heck out of him. 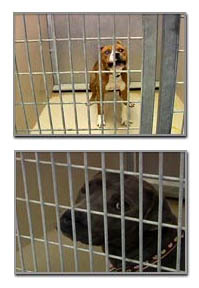 I used everything, I even had a piece of cement banging on that male dog trying to get him to let go," Cox said. Cox says the dogs turned on him, biting his arm so hard that it was still in a brace when Cox spoke with NewsChannel 11's Julia Bruck Tuesday afternoon. 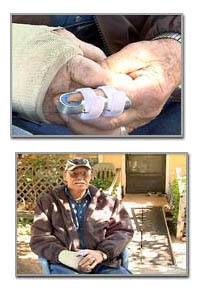 "I had it in a cast for almost two months," Cox said. "It's really been quite alarming for us," Lubbock's Director of Animal Services Kevin Overstreet said. The number of recent attacks is cause for concern at the Lubbock Animal Shelter. Overstreet says people need to know what they can face if their dog attacks. "This not only could cost you financially, it could also cost you your freedom," Overstreet said. State law now holds a dog's owner criminally responsible if the animal attacks a person unprovoked and off its property. "If you raise that dog then you should be responsible for that dog," one Lubbock dog owner said. "It's the owner that is responsible for the dogs. Dogs aren't bad themselves. It's the owner that makes them that way," another Lubbock dog owner said. Cox went before the grand jury Tuesday morning, and he says he wants the owner to be punished. "The maximum punishment they can get and then some and they're liable for this, and for my stress and having to wear this. I'm going to have to wear this wrist brace for at least 8 more months," Cox said. We want to remind folks that an indictment only means the grand jury decided there is enough evidence to go to trial. Johnson is not convicted of a felony right now. If convicted he faces up to 10 years in prison. If a dog kills a person, the owner faces double that. "He was blind. He didn't stand a chance."